Here, you will find personal stories of people that have participated in our unique dolphin therapy programs over the years. 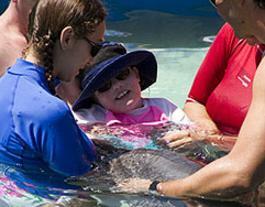 "We took Paulina for dolphin therapy with Living From The Heart in 2007. Every since we returned everyone says that Paulina is such a happy girl. Before she could be miserable anywhere ! Before Paulina's dolphin therapy she had eye contact only with me and her Dad, and not always with us. Now her eye contact is excellent. MANY other positive changes in Paulina include: she is much calmer, her attention span has greatly increased, her language skills are greatly improved. Another remarkable change is that before her time with the dolphins Paulina covered her ears much of the time, and now she does NOT!! Before the dolphin therapy Paulina didn't sing --now she sings often! Also, immediately after our return Paulina wanted us to have a party for her. We couldn't believe it because before she was not social at all. Even though we were tired from our trip we gave Paulina a BIG party and she had a great time. These changes have stayed with Paulina for two years now. We are returning in June for more dolphin therapy with Living From The Heart and can't wait to see what positive changes we will see in Paulina this time." 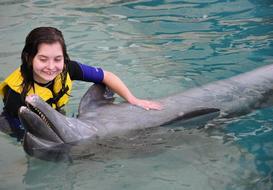 Paulina receiving a kiss from Amizcle in one of her autism dolphin therapy sessions. Paulina "is not the same girl as she was before dolphin therapy" according to her Mom, Rosie. Update on Paulina after her dolphin therapy June, 2010 . . .
Paulina's doctor noticed right away the difference in Paulina after our trip to Cozumel this year!! He immediately noticed how much calmer she was and that she answered all of his questions very calmly and clearly. This is a big change. He had seen her shortly before we went to Cozumel and saw her almost immediately after. 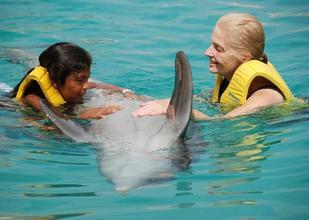 Paulina is talking much more and her language skills have improved even more since her first dolphin therapy in 2007. She is also even more social and confident. ALL OF THESE THINGS had improved after her first dolphin therapy in 2007 and have visibly improved even more since her most recent dolphin therapy in June, 2010. Sophia (pictured below with Susie) joined Living From The Heart for dolphin therapy in Puerto Vallarta in 2006 and again in Cozumel in 2010. 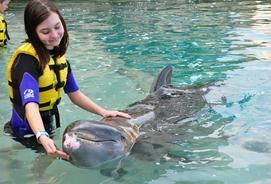 "During our trip to Puerto Vallarta one day we were on our way to the dolphins and Sophia began talking to her sister! This was very unusual. She became much more social and was talking more while we were in Vallarta and that continued after we arrived back in Florida. 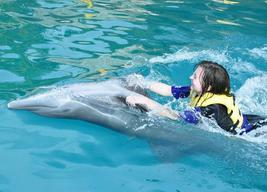 We again took her to the dolphin experience, Living From The Heart in Cozumel last summer (2010). She became very attached to Cotty, the dolphin trainer as well as Amizcle the dolphin. Sophia cried for Cotty and Amizcle for over a week she missed them so much (especially Cotty). This is actually very good, because in the past she does not get attached enough to anyone or anything to feel that much emotion. We plan on returning to Cozumel next summer. Another thing that was profound was that Alex, an autistic boy who was there for the dolphin therapy was afraid to get in the water. Sophia showed him that she could get in and "how to" and he followed her. This was very empowering for her because she is usually the follower. Sofia getting familiar with the dolphin. Amizcle is the grand-daddy of all dolphins! Kammie Wolpert shown above, suffers from trisomy 18 (T-18) a terminal illness that causes severe handicaps. Kammie is unable to speak and nearly unable to use her limbs and muscles. The Wolpert family spent a week with Living From The Heart, and Kammie's results were remarkable. In addition to using her otherwise dormant limbs, her attention span increased during that week of dolphin therapy. Though her mouth will never form words, Nouba (our dolphin friend) helped her laugh with ease. After taking turns holding Kammie and sharing the pool with Nouba, Jude and Bill, her Mom and Dad, were overcome by extreme relaxation and inner peace. This is an excerpt from "Good Animal News", Looking to Dolphins for Human Therapy, by Dora. This is an excellent example of the strong connection between humans and dolphins. "For a few hours, Kammie Wolpert was like any other 9 year old girl. She giggled when the dolphin nudged her chest with its snout, and encouraged by the dolphin trainer, she gripped the tiny mackerel and fed it to Nouba. In return, the dolphin massaged her knees, encouraging her to leave the fetal position and stretch out her slender white legs." June, 2010 was my second trip with Living From The Heart! My first time was with them in Puerto Vallarta and it was such a joyous time!! I have serious injuries from an auto accident a decade ago --generally my ribs and side hurt 24/7 and there is a lot of scar tissue that has built up over the years. I experienced (in the past!) pain pretty much all the time. 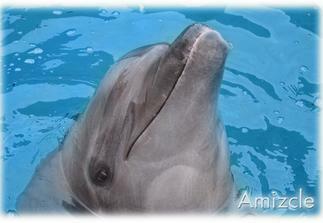 After my sessions with Amizcle my dear dolphin friend, my pain level has decreased GREATLY, I take far less medications. Upon returning home I went to my massage therapist who said "I want to meet this dolphin, who is he???!!!" She could feel the difference in my body, especially the ribs and that entire side that she had become so familiar with over the years of working on me. Susie receiving the benefits of dolphin therapy. 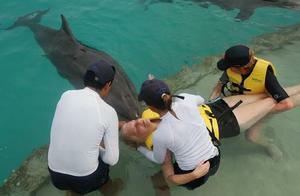 Above, we can see Kammie Wolper with her Dad, Bill, Briana, Andy in one of our dolphin therapy programs. Our precious dolphin friend Nouba is receiving a fish from Kammie. Read below to find out how Kammie benefited from our program. Below, we see Kammie enjoying a close encounter with Nouba. Our 11 year old daughter on the autism spectrum had a lifelong fear of water, and never let go of her grip on a parent in the deep end of a pool before. During our first day of dolphin therapy, she floated independently in the deep end, (with a life jacket on) and then surprised us all by taking a ride on a fast moving dolphin clear across the pool, water splashing in her face the entire time! (see image below) Since she's been home, she has begun showering independently, something she was not able to do before, due to intense fear of getting her face wet. 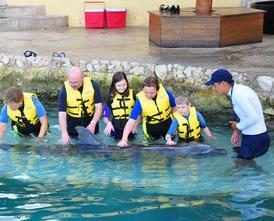 We had a wonderful time as a family with Macy and the Dolphins in Cozumel. To keep up with the O´Neill family adventures, take a look at their blog by clicking here. Riley enjoying a dolphin belly ride across the pool. Truly a breakthrough for her! On John’s first Dolphin trip he was able to communicate with the group by holding a rubber dolphin and touching it to his sister’s face as if it where kissing her. This brought the entire group to tears. During the dolphin therapy sessions John was able to relax his body in ways we have never seen or been able to duplicate outside of these sessions. This relaxation lasted for several weeks. At home when John experiences extreme spasticity or is in a stressful situation, we use visualization techniques (taught to us by Macy) to help him “see/feel” being in the water, feeling Amizcle’s sonar and relaxing. This has immediate results and we use it often. There is no question these sessions have helped him in many ways and have been an experience of a lifetime for all of us. Below is Dr. John Hicks and wife, Betsy (that's them hugging!) with family and friends in November, 2011. 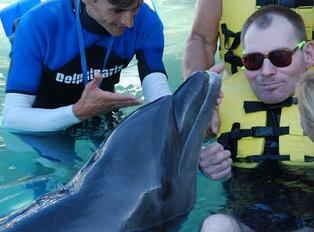 This trip was an autism dolphin therapy trip for their son, Joey. Dr. Hicks and Betsy have a very unique "clinic" called Elementals Living, where they work with many different chronic disorders, including autism. Their goal is to "get to the core of each symptom & treat the body as a whole." Dr. Hicks was recently published in the Autism Science Digest Magazine. Dr. Hicks meets with people all over the world via Skype. Nutrition plays a large role in their protocol. Joey meeting a dolphin with his dad, Dr. John Hicks. 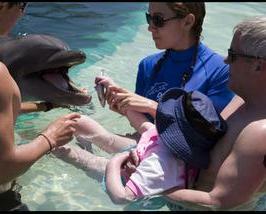 "Before Paulina's dolphin therapy she had eye contact only with me and her Dad, and not always with us. Now her eye contact is excellent." "Since she's been home, she has begun showering independently, something she was not able to do before, due to intense fear of getting her face wet." Enjoy the videos below from John´s dolphin therapy in 2011.